Here is today’s Passage for those following along with the counting of the Omer and reading in Psalms with me. As I said previously Psalm 119:11 is so special to me. It is one of the first verses I taught my little Prims when I was a “Sunday school” teacher. Oh the importance of having His precious word in our hearts. That way when the tough stuff of life comes against us, we have a deep well of hope, love, strength and peace to draw from. I pray that you will join me in working on continuing to “hide HIS WORD in our hearts. Blessings to each of you who takes the time to read His Word and Do HIS Word. Now on to my projects for today. They are a couple of quick and easy cards that any crafter will need in their card-making arsenal. 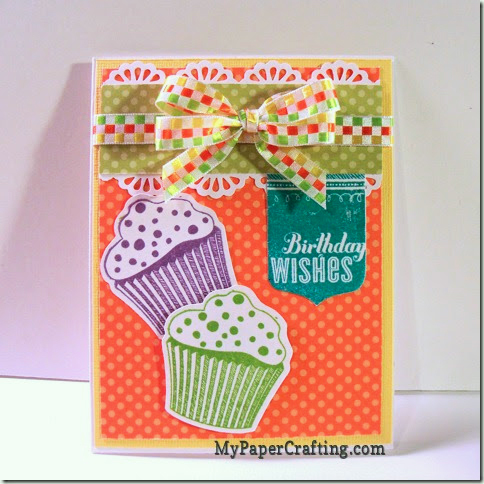 I recently participated in an online National Scrapbook Day event and one of our challenges was to do a birthday card. So I didn't want to take too much time as there were other challenges to get to. So this is what I came up with. Here’s my first card. I used the Cricut Artiste stamp set and cartridge to create the cupcakes. I simply cut them out and then stamped in Pear Ink and Gypsy Ink . I then inked the Birthday Wishes stamp with some Lagoon ink. I used some of the (retired) CTMH Dotty For You paper . I then added a couple of borders of white cardstock using an EK Success border punch. Lastly I added a bow with some ribbon in my stash. I purposely picked colors that could be used for a boy or girl card. For my second card, our challenge was to use: Pink, Blue, Green and Yellow. I used the same Artiste cuts and stamp for the cupcakes. I did use some foam tape to give the cupcakes a little life. 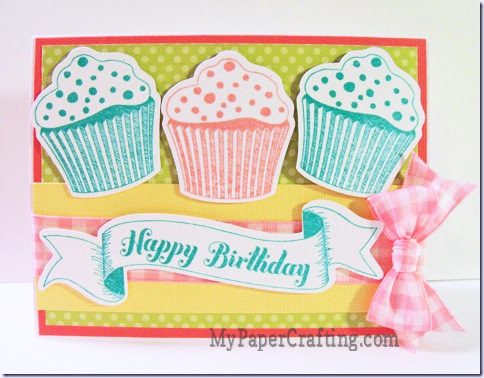 This time I used some of the Crystal Blue Ink and some of the Blush Ink to stamp the cupcakes. The happy birthday sentiment was also stamped in Crystal Ink. I again used some of the retired dotty for you paper and then added a simple strip of yellow cardstock. Lastly I added a strip of ribbon and a pink plaid bow. Simply easy and quick.